How could simply taking your dog for a walk raise $40,000 for pets in need? When more than 400 dedicated animal lovers come together to support homeless pets. 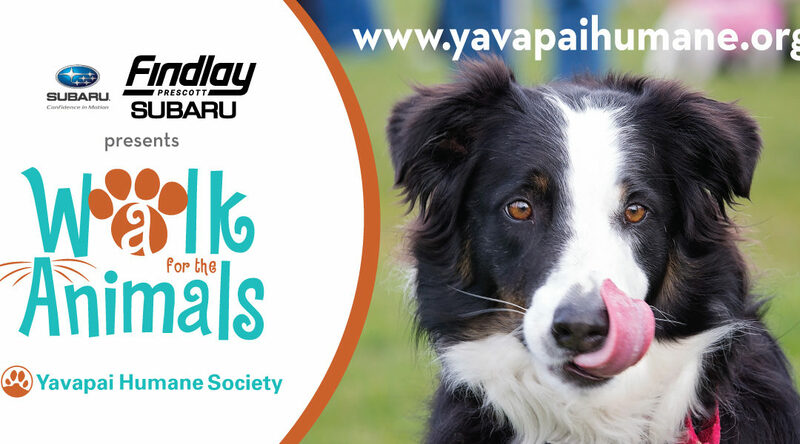 It’s called peer-to-peer fundraising and it’s exactly what the Prescott-area community did for Yavapai Humane Society (YHS) last weekend at the 7th annual Walk for the Animals sponsored by Findlay Subaru in Prescott. “Every dollar raised through this event stays right here in our community helping to fund more than two dozen programs and services that help support pet owners in need as well as more than 3,000 of the most vulnerable dogs, cats, and equines who come to YHS each year, “ says Terri Davis, Marketing Manager at YHS.. Hundreds of dogs brought their people out to this premier pet lover’s event to enjoy a beautiful 5K or 1-mile course and enjoy fun activities which included a lure course by Brittany AZ Rescue, pet-friendly vendor booths, dog adoptions sponsored by Cable ONE Advertising, animal wellness tent offering low cost vaccinations and microchips sponsored by Prescott Area Pet Emergency Hospital, music, food, face painting,and more. By all the laughs and cheers, it was clear that the crowd-favorite was the Strut Your Mutt contest sponsored by B&M Painting. Dogs competed in three fun categories: best trick, best costume, and owner look-alike. The hundreds of smiling faces at the Walk for the Animals—both human and canine—were a true testament to the joy a pet brings and the love of animals this community shares.